South Korea's first dual-use commercial and military communications satellite is now in space after a successful blastoff from a floating platform in the central Pacific Ocean. The 22nd mission for Sea Launch's Zenit 3SL rocket began with a fiery liftoff from the Odyssey launch platform at 0327 GMT Tuesday (11:27 p.m. EDT Monday). Positioned along the Equator at 154 degrees West longitude, the former Norwegian oil-drilling rig was in a prime location for the three-stage rocket to receive a boost from Earth's faster rotation at such low latitudes. It took just over an hour for the launcher to release the Koreasat 5 satellite in the targeted oval-shaped orbit stretching from a low point of about 1,800 miles to a high point of around 22,300 miles. Its inclination was zero degrees. A few minutes after spacecraft separation, controllers in the Sea Launch command ship received word that an Italian ground station had heard the first radio signals from Koreasat 5, proving the 9,806-pound satellite was in good health following the harrowing ride to orbit. Sea Launch president and general manager Rob Peckham confirmed the success in front of a group of invited guests gathered at the company's California headquarters. "This has been another extremely successful Sea Launch mission." Koreasat 5 will soon maneuver itself into a circular orbit some 22,300 miles above Earth. In geostationary orbit, the craft will be anchored above the Equator at 113 degrees East longitude, or directly over the island of Borneo. Once in the correct orbital slot, Koreasat 5 will begin operations scheduled to last up to 15 years. Carrying a high-powered payload of broadband transponders, Koreasat 5 will operate on behalf of South Korea's Agency for Defense Development and the KT Corporation - a leading telecommunications provider in the Asia-Pacific region. A total of 36 transponders are split between the two co-owners. With the new satellite, South Korea's military will have a dedicated system to offer a secure route for critical communications throughout the armed forces. Eight channels in the super high frequency band and four Ka-band transponders make up the craft's payload. 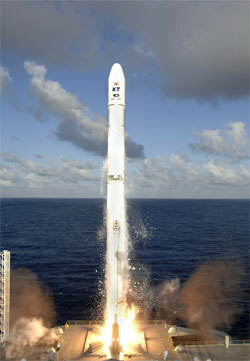 Koreasat 5 is the nation's first satellite with military communications as a primary objective. "I am very pleased with this perfect flight," said Jong Soo Kim, head of the Agency for Defense Development. "The year 2006 marks a new year in Korean military communications history." Koreasat 5 also includes technology and systems developed for the French defense ministry's Syracuse 3 program. "Koreasat 5 will be the essential equipment for the future combat system in Korea," said Major General Chi Gue Rim of the country's Joint Chiefs of Staff. "It will play one of the most important roles for military operations in the Asia-Pacific area." KT Corp. will be responsible for 24 Ku-band transponders that will reach commercial customers in a swath extending from eastern China southward to the Philippines. This coverage area also includes the Korean peninsula and Japan. Half of the KT Corp. transponders will be attached to regional beams to provide broadband multimedia and digital television services to operators scattered throughout East Asia. The remaining payload will be set aside to replace domestic capacity currently offered by Koreasat 2, a satellite now more than ten years old. "When we started this program, Korean satellite operators told me it would be difficult to work with the government side. However, both KT and ADD cooperated very well on many issues," said Gwang Ju Seo, executive vice president of KT Corp.
"Koreasat 5 is on its way to 113 degrees East...It will enable KT to continue providing high quality data and video service to our (various) customers in the Asia-Pacific region." Koreasat 5 was manufactured by France's Alcatel Alenia Space and is based on their new-generation Spacebus 4000 C1 spacecraft platform, which features an updated avionics system designed to accommodate larger satellites. 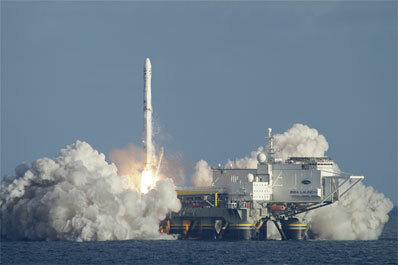 The contractor is also supplying Koreasat 5's ground system and launch and in-orbit commissioning support. The agreement was made in a 2003 agreement worth 148 million euros, or roughly $170 million using historical currency exchange rates. "Alcatel Alenia Space is very proud to have delivered this satellite in time and with very good performance," said Jean-Marie Robert, a senior vice president at the company. "I would like to wish a very long life for this satellite." The craft is the fourth in the Koreasat series, following in the footsteps of commercial satellites launched in the 1990's. Koreasat 1 was retired last year, while two others continue to operate well. Officials chose to skip over the name Koreasat 4 because the number "four" can represent death in some Asian cultures, reports say. In Korea, the Koreasat satellite family is dubbed Mugunghwa, which in English is the Rose of Sharon - the national flower of South Korea. Sea Launch has two more launches on its books to round out this year.